The 30RC (MDF) is an arch-top one-piece, solid MDF (Medium Density Fiberboard) door. 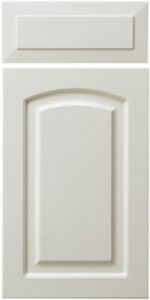 If you plan to paint your cabinets, then consider this door as an alternative to a wood arch-topped doors. Note: inside corner of routed detail are not square, they are radiused. For squared corners, consider the SQ series of MDF doors.